Bastiaan obtained a smoke detector to conform to rental requirements, but we might be able to make more out of it. The interesting pin is 7: I/O. 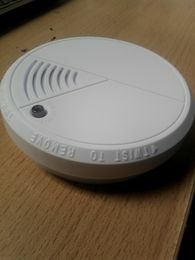 Although there are no specific details the description mentions that "It can be used to connect up to 40 detectors to make auxiliary alarm, remote alarm, auto dialer..."